Climate change research via speleothem studies lead by Dr. Kathleen Johnson (UC, Irvine) and team. Dr. Johnson’s study is the first long record of Lao paleoclimate change ever undertaken. Preliminary data (3 cave sites) covers the entire Holocene/Deglacial and some of the glacial (> 50,000 years). Next step begins during the MMAP 2013 season: fill in more speleothem data for the past 20,000 years and correlate this with MMAP archaeological finds/indications of changes in cultural practices. Dr. Johnsons’s 2013 team includes veteran caver/speleothem researchers who will be exploring more challenging caves than those sampled in 2010. Analyze plant remains, shell and animal bone remains, and ceramics excavated in previous MMAP seasons. Refine GIS data and improve MMAP database; take DNA samples. The MMAP 2013 Survey Team was a collaboration of U.S., Lao, British, Australian, Cambodian, Filipino, and Thai colleagues. During the 2010 season, the MMAP team excavated a cave site called Tham An Mah that was used in historic times as a Buddhist temple and, judging from its location and surface finds, also had the potential for good prehistoric material. A team of international experts will be researching other facets of the site. Excavation produced several Iron Age burials, some of which were unique for this area. Two experts from University of California, Irvine (Kathleen Johnson) and Australia (Michael Griffiths) conducted speleothem research in the deep caves around Luang Prabang. Speleothems are the technical name for what we nongeologists call stalagmites, stalagtites, and flowstone. They drilled into the speleothem layers to take core samples; later in the lab they will examine the thickness and mineral content of the individual layers in an attempt to reconstruct thousands of years of climate and climate change. 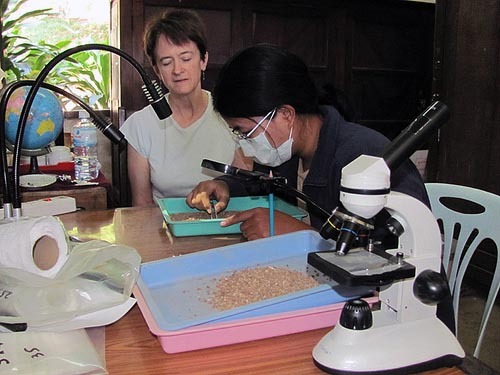 Under the supervision of Dr. Gillian Thompson from the University of Bradford in the U.K., the team performed flotation on the soil from Tham An Mah in order to extract and identify seeds and other plant remains from prehistoric contexts. The team continued to train Lao archaeologists, not only in excavation, but in survey and analysis. The goal was to leave the Laos with a working database system and training so that they can do their own survey work when we are gone and put the new site data into the same tables. This will allow them to maintain a comprehensive and standardized system for site recording. 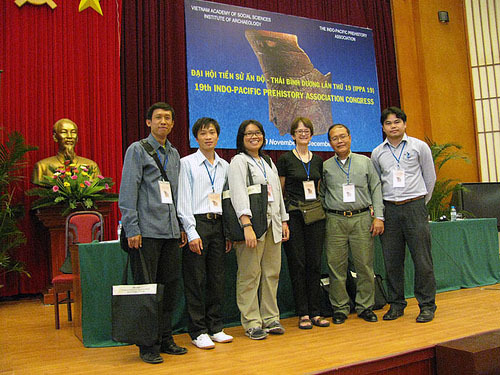 MMAP team members traveled to Hanoi in late November 2009 to present papers at the Indo-Pacific Prehistory Association (IPPA) conference. The IPPAs are the most important conference meetings for Southeast Asianist archaeologists in the world, with over 500 participants. These meetings occur only once every three to four years, so the 2009 conference was an important place to report on MMAP progress from the previous three years of field work and training seasons. Nine MMAP team members presented papers: MMAP co-directors Joyce White and Bounheuang Bouasisengpaseuth, Lao team members Phousavanh (Phou) Vorasing, Souksamone (Pong) Sonethongkham and Sengphone Keophanhya, Thai team members Korakot (Kot) Boonlop and Sureeratana (Joom) Bubpha, Ben Marwick (University of Washington) and Helen Lewis (University College Dublin). 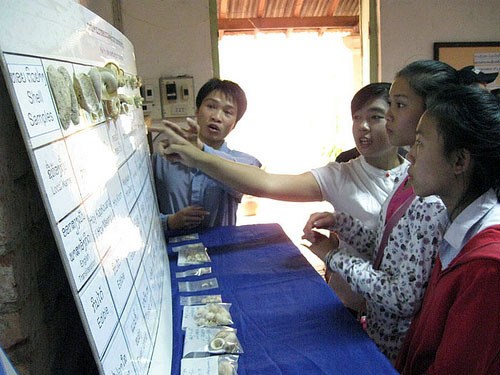 Phousavanh (Phou) Vorasing, in a talk that received praise from senior archaeologists at the conference, reported on the results of his ethno-archaeological investigation of shell remains uncovered in three MMAP excavations. Phou studied the shell species found archaeologically, and conducted interviews in the street markets of Luang Prabang with women who collect and sell snails and other shelled species. By doing this, he was able to get an idea of the relative abundance and collecting season of each species found in the prehistoric sites. 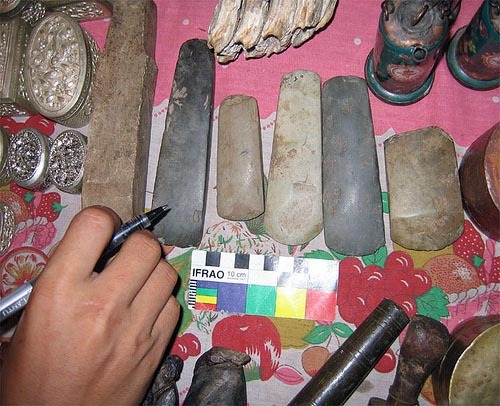 Souksamone (Pong) Sonethongkham used his 2009 training in rock type identification and stone tool recording to present findings about variations in stone tool cores found in three rock shelter sites excavated by MMAP. Using data from the excavated sites, Joyce White and Pong had discovered that there were real differences among MMAP sites in the kind of stone used for core tools—the first time anyone had ever looked at those kinds of distinctions in Southeast Asian hunter-gatherers. 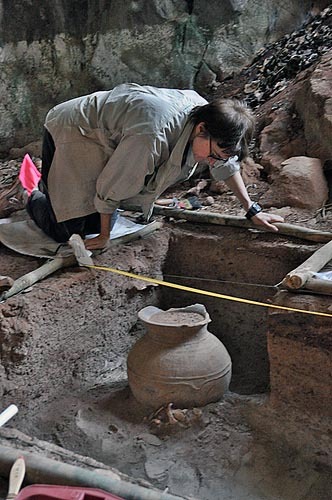 In 2009, the Middle Mekong Archaeology Project (MMAP), directed by Joyce White, received the first installment from the Henry R. Luce Foundation of a $300,000 four-year grant to advance Southeast Asian collaborative archaeology. 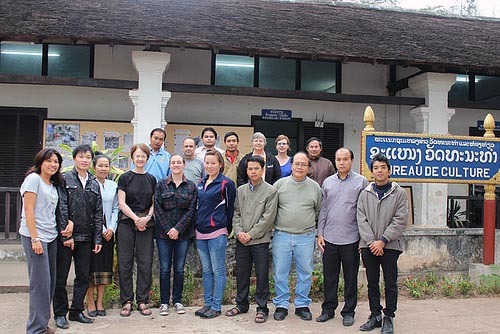 The nine-week training program in Luang Prabang, Laos, was conducted in two parts, both focusing on developing modern archaeological skills among Lao and Thai heritage managers. 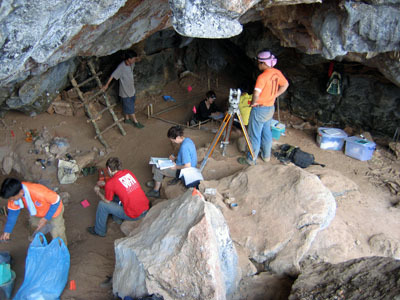 In June 2009, a two-week training excavation took place at Tham Sua (Tiger Cave). 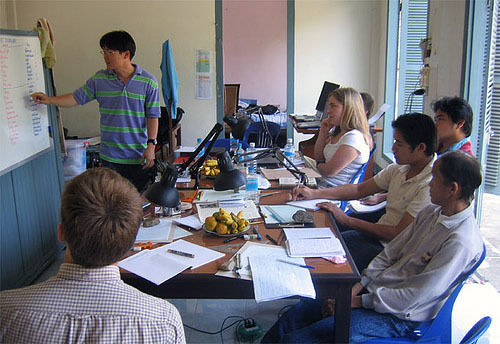 In February and March 2009 practicums were conducted by foreign and Lao experts in archaeological database management, computer skills, stone identification, GIS and mapping, lithic analysis, archaeological illustration and photography, archaeobotanical analysis, and exhibition development, all using MMAP data. At the same time the team members were conducting site survey using mobile GIS technology, adding eleven new sites to the MMAP total. The skills acquired in database entry, stone analysis, and shell analysis resulted in the presentation of three papers by MMAP trainees at the 2009 meetings of the Indo-Pacific Prehistory Association in Hanoi. Click here for more information about this conference (MMAP 2009c). Click here for a more detailed list of all MMAP team members. 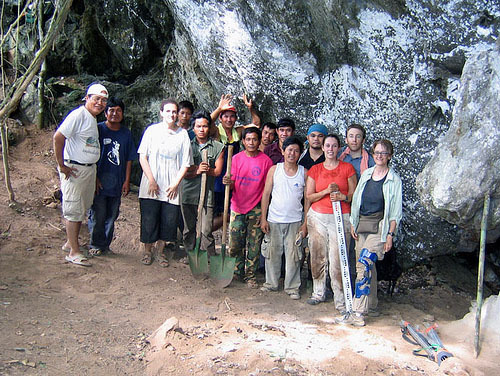 In 2008, MMAP undertook a test excavation at the Tham Vang Ta Leow rockshelter in northern Laos. During the field season, evidence for Stone Age occupation dating back to 11,000 years ago was found in the rockshelter. Future work, funded by the Henry R. Luce Foundation, will include additional survey and excavation in Laos and Thailand, and will involve intensive training of local Lao and Thai archaeologists. MMAP completed its first test excavation season in Laos in July 2007, two years after a remarkable survey season in 2005. Dr. Joyce White is more optimistic than ever that the region, a virtual terra incognita among archaeologists until now, holds great promise to provide important pieces to the puzzle of human habitation and settlement during Southeast Asian prehistory, a period reaching back into the late Pleistocene at least 20,000 years ago. 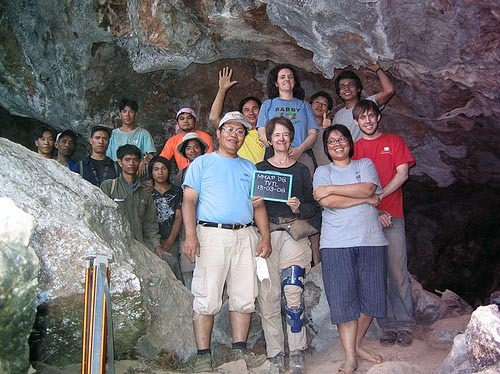 The 2007 test excavation site, Phou Phaa Khao Rockshelter, provided Dr. White and her team with new challenges, as she worked with an enthusiastic but variably-trained group of collaborators at this cave 30 miles of dirt road from Luang Prabang city—outside the range of cell phone signals or electricity—during the unpredictable rainy season. Although there was no specific evidence to suggest this site was used during the middle Holocene period, the site had strong evidence of human occupation and settlement during both the stone age (10,000 to 5,000 years ago) and the iron age, sometime after about 3,000 years ago. 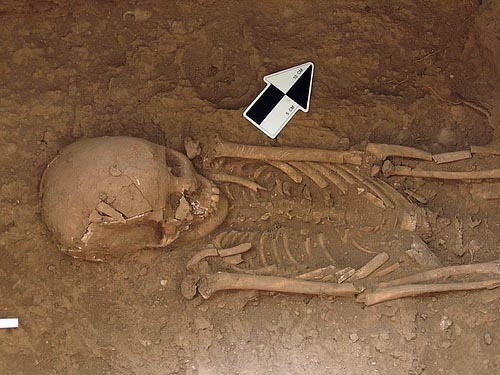 Parts of seven human burials, more than 2,300 fragments of stone artifacts and manufacturing debris, and a variety of both earthenware and stoneware ceramics were excavated by the team. For the next step, the MMAP team hopes to continue test excavations at additional sites on other tributaries of the Mekong River, looking particularly for Middle Holocene evidence, but carefully collecting whatever data is unearthed. The research will simultaneously deepen knowledge of the Lao archaeological record and train the next generation of Lao archaeologists. Much of archaeological research involves laboratory analysis, namely, tasks associated with recording and analyzing artifacts recovered from surveys and excavations of sites. The training objectives of MMAP overall include not only fieldwork (excavation and survey) but also training in archaeological laboratory analysis. The training in MMAP 2006 focused on laboratory aspects of archaeological research, using the stone artifacts recovered during the site survey conducted by MMAP 2005. The specific plan for the MMAP 2006 season included developing skills in archaeological illustration, photography, data recording, and databases. Training was accomplished by lectures in Lao and Thai and intensive supervised hands-on work,primarily with stone tools. We worked with stone tools not only because many of the artifacts discovered in MMAP 2005 were of flaked stone but also because flaked stone tools represent the oldest tool technology recovered. Working with these tools would allow the trainees both to acquire basic skills in archaeological analysis and to build a foundation of knowledge in Lao prehistory. The Luang Prabang National Museum generously provided a room on the museum grounds for the MMAP team to use as a training laboratory. Acknowledgements: The 2006 Survey season was supported by grants from the National Science Foundation, the National Geographic Society, and the University of Pennsylvania Museum. 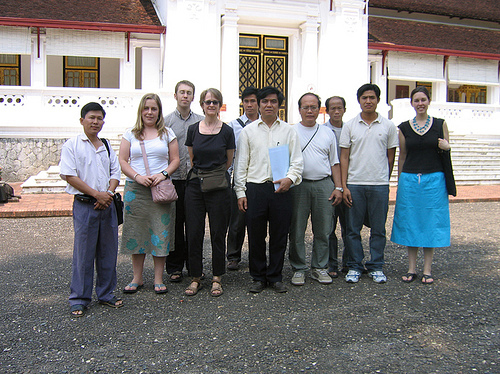 In March of 2005, the first MMAP team arrived in Luang Prabang, Laos. In this lovely UNESCO World Heritage town, we established our base to begin a multi-year journey of archaeological and cultural discovery in a region virtually untouched by modern archaeological research. 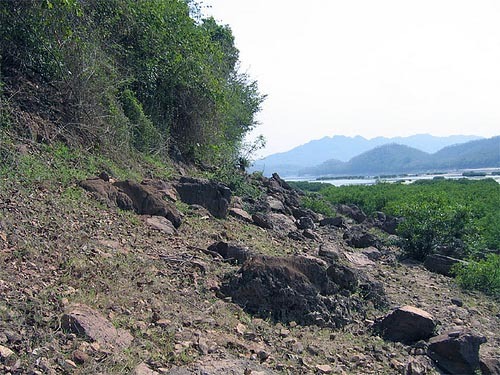 The purpose of the 2005 MMAP Survey was to explore three river tributaries on the left (eastern) bank of the Mekong River in Luang Prabang Province, and to locate and record those sites with potential for future in-depth exploration and excavation. So much casual evidence already existed, from French colonial accounts to ancient artifacts sold in modern-day Lao markets, that MMAP archaeologists hypothesized that this area would have abundant evidence of prehistoric settlements, including stone age, neolithic, and metal age sites. Our 2005 survey had to cover about 1500 square kilometers of sometimes rough terrain in less than a month, so we needed to be efficient with our time. Two separate teams did rapid surveys of the three tributaries of the Mekong River in Luang Prabang Province. Using mobile GIS (Geographic Information System) technology, along with digital photography, MMAP was able to evaluate data and do surface collecting from numerous potential sites, more efficiently than would have been possible with more traditional recording methods. Working with Lao local knowledge also made for efficient fieldwork. Village chiefs gave us permission to explore and they assigned villagers familiar with their areas to guide us to potential sites, and also (very important!) to keep us away from the unexploded bombs of the Vietnam War era. The MMAP Survey returned with a rich variety of data. In only 21 days in the field, the team identified 57 sites with potential for further research. We also saw the grand openings of bilingual exhibits in Luang Prabang and Vientiane, which MMAP developed to explain our first-year efforts to Lao officials and stakeholders. Acknowledgements: The 2005 Survey season was supported by grants from the National Science Foundation and the National Geographic Society. The MMAP 2005 Survey Team was a collaboration of U.S., Lao, British, Australian, and Thai colleagues. In 2001, Dr. Joyce White undertook a quick assessment survey with Bounheuang Bouasisngpaseuth, an official at the Lao Department of Museums and Archaeology. They confirmed that Luang Prabang Province holds unusual potential for finding in situ prehistoric evidence. In only three days, Dr. White saw signs of over 10,000 years of human occupation in a very small geographic area, including at least one potential habitation site, hundreds of polished stone adzes, and numerous ceramic and bronze artifacts.